The Wiener's Circle has backed the Cubs by going in costume as Goatbusters for the Halloween weekend. LINCOLN PARK — The Wiener's Circle ain't afraid of no goats. 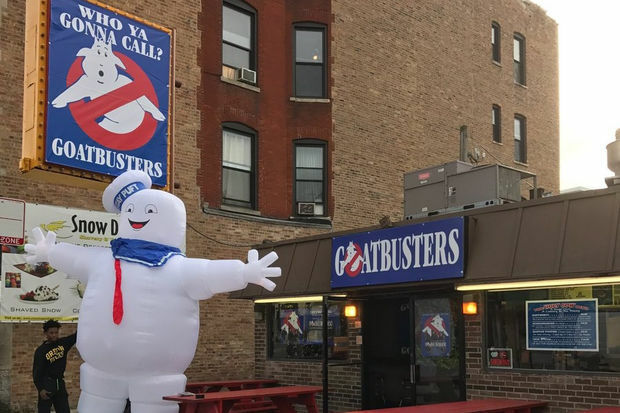 The determinedly ornery, in-your-face hot dog stand combined its support for the Cubs with what's become an annual Halloween stunt Friday by converting to a restaurant called "Goatbusters" for the weekend. Playing off the movie "Ghostbusters," which leant its title tune to the San Diego Padres for what became "Cub Busters" on the film's release in 1984, "Goatbusters" suggests the Cubs and their fans ain't afraid of no Billy Goat curse. Bill Murray, the "Ghostbusters" star who sang "Take Me Out to the Ball Game" for the Cubs' seventh-inning stretch in their first World Series game in 71 years Friday at Wrigley Field, was seen in the stands wearing a Goatbusters T-shirt earlier in the playoffs. Last year for Halloween, the Wiener's Circle converted to McDowell's, a McDonald's send-up borrowed from the Eddie Murphy movie "Coming to America." More recently, the hot dog stand won a wager against its Los Angeles counterpart, Pink's, when the Cubs topped the Dodgers in the National League Championship Series. Then it opened the World Series by taking on the Cleveland Indians' voodoo god Jobu from the movie "Major League" — in no uncertain terms. The Cubs lost their Friday home World Series game to the Indians 1-0 to fall behind 2-1 in the best-of-seven set. They play the next two games at Wrigley Saturday and Sunday and hope to force the series to return to Cleveland for the finish.